Cheers: Very nicely polished, work as advertised.
" When Pro-Seal gets between the rivet and the skin it makes the set rivets stick up about .007" above the surface of the skin. These tank dies make a dimple .007" deeper to accommodate that. Therefore you don't have to try and sand, shave, or file the rivet heads down, just wipe over them with lacquer thinner and you are done (And you will be glad when you're done!). The dies are also useful for another purpose, the entire substructure of the airplane. Have you ever noticed how the skin and the substructure don't nest perfectly together until you mash it with the rivet gun? Well I sat down one day and did the math and it turns out that in .032" skin the optimum dimple should be .011" deeper in the substructure for the dimples to mate perfectly. Now we do make a substructure die also but if you are going to have the tank dies you might as well use them for the substructure also." Ok.........let's just say he got my attention! Now, Mike is a real honorable type fellow, but I wouldn't be discharging my duty as a cynical editor unless I ran some tests to see if these impressive claims were true in practice. So I used the right tank skin on the RV6 as a test bed to see if could tell the difference in a few thousandths of rivet height. It may be hard to pick out in the photo, but I labeled one dimpled hole as "regular" since it had been dimpled with a conventional die, and the other was marked "tank", because I redimpled that hole with the Cleaveland tank dies. 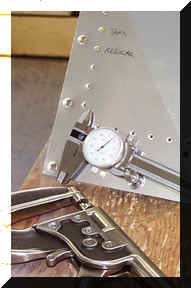 A dial caliper was used to measure the amount of "set" resulting from each die. The regular die formed a dimple that left the top of the rivet .003" below the surface of the skin. The tank dies left the rivet .009" below the surface of the skin. Hmmmmm......subtract 6 from 9.....carry the one.........we get .006" difference between the two sets of dies. Mike had claimed a .007" difference, so we will let him pass since the little ole .001" discrepancy may have been due to measurement error. But what difference will the tank dies make once Pro-Seal enters the picture? Today I had my first experience with the "Gray Goop", and after the slime was cleaned off the rivet heads, I measured the set of the rivets. The rivets that were installed in holes that were dimpled with the tank dies ended up .002" below the surface of the skins. They passed the "fingernail" test with flying colors and had a nice flush look. Here is the bottom line. The Pro-Seal raised the rivets .007" above the bottom of the dimple. If I had used the conventional dies, the rivets would have ended up protruding above the skin .004"! This ain't much, but you can sure notice it. So Mr. Lauritsen's claims appear to be valid (I kind'a suspected they would....). The left tank is going to be redimpled with the Cleaveland tank dies (about a twenty-five minute job with the Buchanan dimple table) and whenever there is substructure to be dimpled, the Cleaveland dies with be used. Are the tank dies worth their $38.00 price tag? I think so. 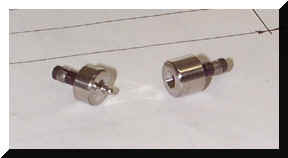 It would be a real hassle to level the protruding rivet heads (how much they protrude is due to your individual dies and technique....your mileage may vary..) that could result from the use of conventional dies. The stainless steel tank dies look like high quality pieces that will last a long time.